Aamen, my nephew loves cakes is an understatement. 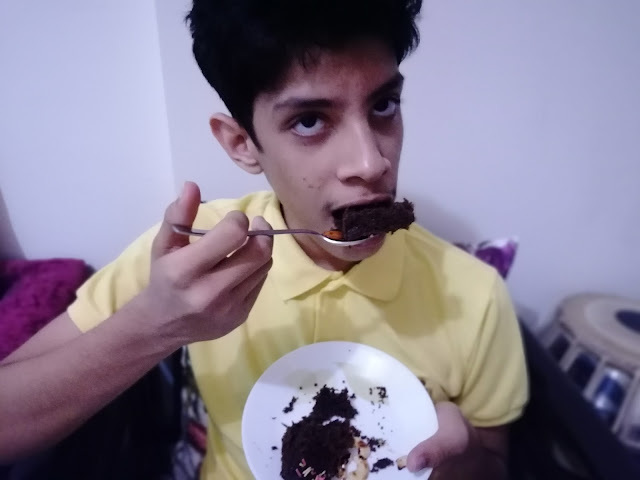 Aamen lives to eat cake every day. Some times I wonder and many times I am sure that he is the reincarnation of Marie Antoinette. Most of the dabbas ( Food Boxes ) in our home are choc-a-bloc with different types of cakes. Choco-Chip Cake in the morning with glassful of Complan-milk, Butter-Scotch Cake with Methi Theplas / Idlis in the school-tiffin , Cup-Cakes with coffee / Upma / Poha in the evening, Walnut brownies/ truffle pastries in between, is Aamen's Cakelicious eatinerary ( i.e. itinerary ) on any given day. You must be wondering , so much of Junk ?. 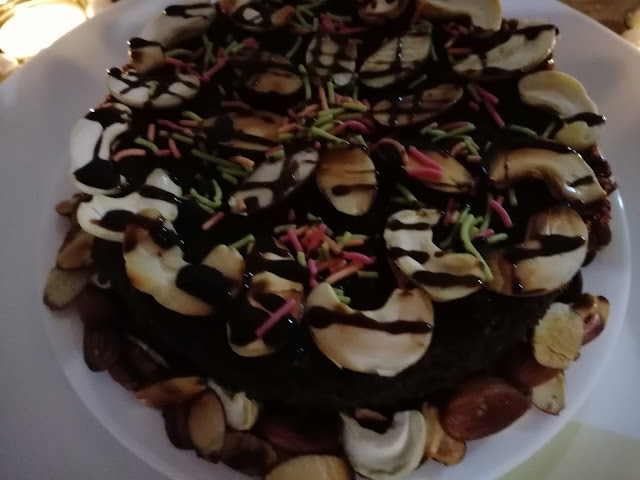 What kind of parents stuff their kids with Maida, maida and more maida through Cakes?. Yes, we understand your concern as well as our duties and responsibilities as parents and at the same time we want our bachcha to be happy. Feeding our children Nutrition through their favorite food is the Key-Mantra. 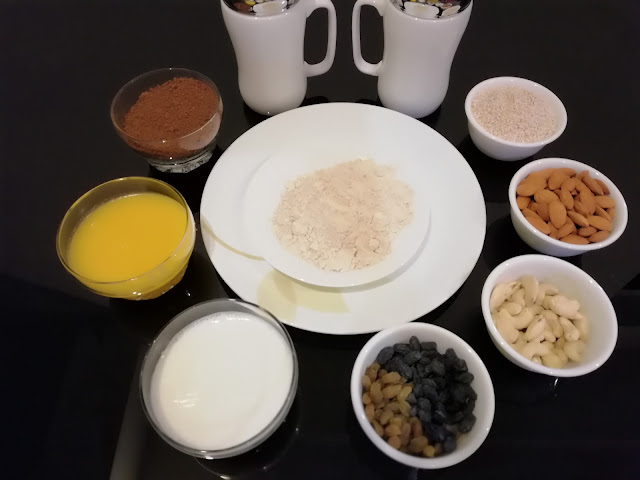 Cake can be healthy too if Maida is substituted with Wheat flour ( rich in Vitamins and high fiber ), Sugar is substituted with Jaggery ( full of Iron, Vitamins, Minerals ), and key ingredients such as, Rajgira laahee / popped Amaranth ( Iron, Calcium, Protein ) or flour of Rajgira laahee , Nuts : Almonds ( Proteins, Vitamins ), Cashews ( Iron, Vitamins, Minerals ),dry fruits : Raisins ( Iron, Protein, Vitamins ), Homemade Ghee ( full of Vitamins , lowers LDL Cholesterol levels ), Milk etc. 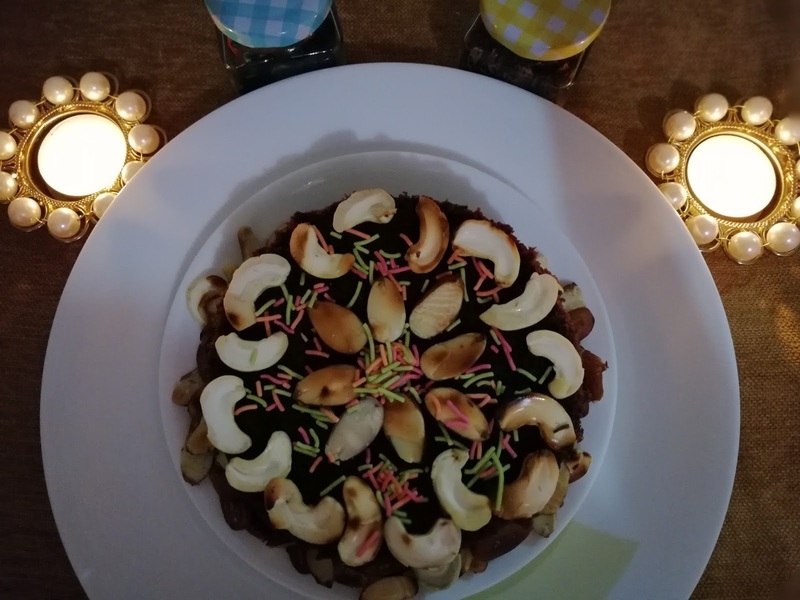 That day, we decided to give a Power packed , Iron full surprise to Aamen by baking a novel Nutty- Nutritious , Iron-rich cake, using Almonds, Cashews, Jaggery, Raisins, Amaranth as the main ingredients. 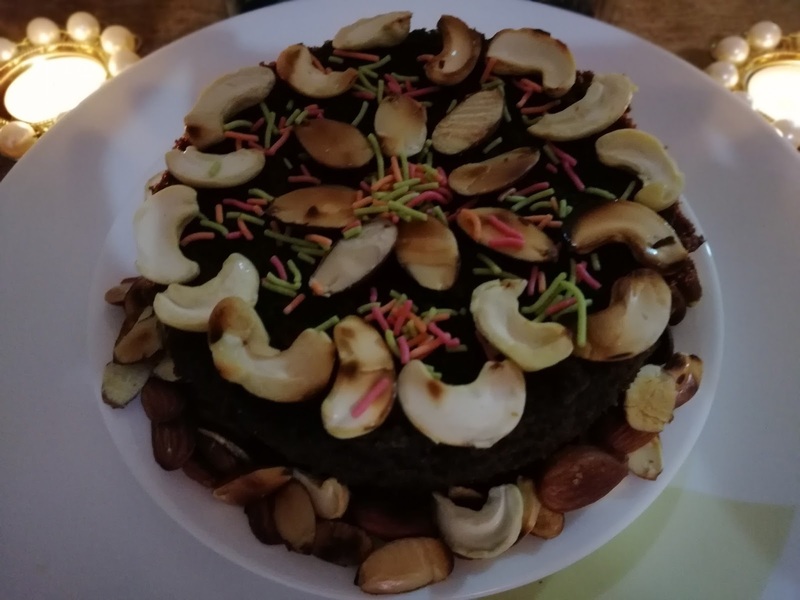 You won't believe me , If I told you that Aamen's eyes twinkled Big Star and his hair spiked on it's own ( OK the later is just a JOKE ) when he saw and tasted the Nutty-Nutritious Cake . 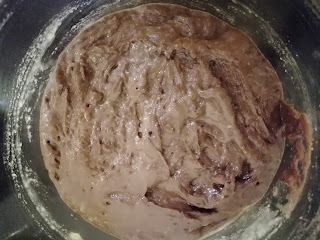 Mix well and Sieve together Wheat flour , Cocoa powder and Baking powder. Beat Ghee & Powdered Jaggery until light & creamy. Add Milk, beating well after each addition. Fold in sieved Wheat Flour , Cocoa powder into the above mixture. Add the powdered nuts ( Cashews, Almonds ) Rajgira lahee or flour and Raisins . Mix well. Grease & dust the baking bowl with maida. Preheat oven to 180o C. Pour the mixture in to the bowl. cover it with foil. Bake 15-20 minutes. Allow to cool in tin for 5 mins. Decorate colorfully. Thanks Anmol. It looks and tastes delicious too. Hey Pragnya , welcome to ' Spirit Of Mumbai' . Pleas Do try this , you both would love it. Wow..had never heard of amaranth cake. I am definitely making this. Loved your narration and God bless, Aamen because of which you try different recipes of cake. A healthy way to relish the most loved bakery product! Thank you for the recipe. O wow, loved the recipe. Looks yummy, want to sink my teeth into it! This is a healthy recipe! I am sure my kids would love it. I live for cakes too :) I have currently stopped having bakery items :( but this one has all my heart and I will make this for sure. Super simple and easy! awesome. The ingredients are so healthy. I am sure the cake must be a truly a power packed cake. Its been over a year that i switched to no maida and no sugar cakes and use wheat flour and jaggery as substitutes. Honestly, I find the taste is similar to a regular cake! Heard about using Amaranthus seeds for the first time though! Will give it a try. Hey Anshu , Thanks. Amaranth - Rajgira tastes delicious but only 1/2 cup otherwise your can use the flour of Rajgira too , which is readily available in many shops. Hey , Welcome to ' Spirit Of Mumbai'. Thanks. Rajgira is wonderful as it is too.